Chris Lam is a business litigator who enjoys the responsibility of helping clients during challenging times and working to protect their businesses through either the defense or prosecution of claims. His professional accomplishments, leadership, and contributions to the community have been recognized by multiple publications and organizations. Chris has developed a diverse and successful litigation practice, representing both businesses and individuals, in disputes related to contracts, trade secrets, pharmaceutical product liability, defamation, non-competes, motorsports, and private equity investments. He has also represented professionals, including doctors, lawyers, and dentists, in disciplinary proceedings before their respective licensing boards. 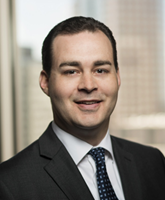 Chris serves as the “point person” for several clients, connecting them to the right firm lawyer in whatever discipline is needed for prompt, effective, and efficient resolution of that client’s issue. He takes pride in being a “one-stop call” for assisting clients with needs including employment law, real estate, corporate, tax, and estate planning. Charlotte Business Journal "40 Under 40"
University of North Carolina - Chapel Hill, J.D.